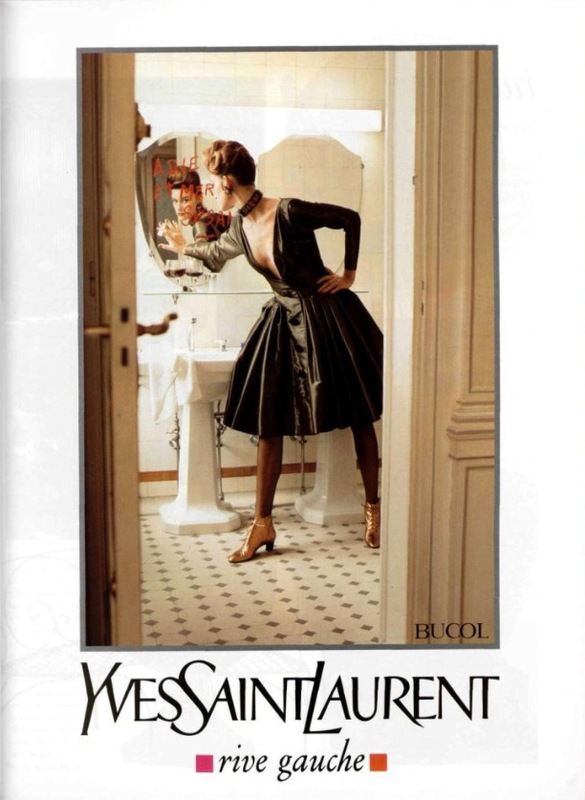 Vogue 1016 by Yves Saint Laurent (1992) Dress and camisole. Image: PatternVault shop. Yves Saint Laurent Rive Gauche Fall 1991 advertising campaign. Photo: Helmut Newton. Image: jalougallery.com. Newton’s photograph shows a woman standing in the well-appointed bathroom of a Parisian hotel. (Another campaign photo shows Karen Mulder in the parking garage.) She wears the long-sleeved version of Vogue 1016, sans cami and done up in black Bucol silk. The dress is worn with big, dramatic accessories: a collar, ear clips, and a pair of gold (!) booties. 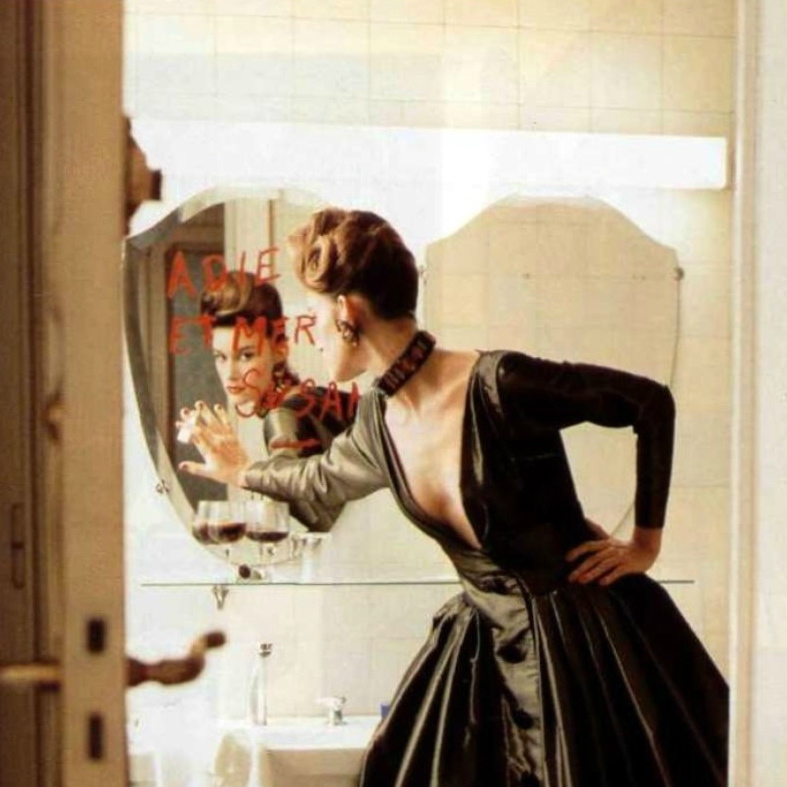 On a shelf before the mirrors are two glasses of red wine; written in lipstick on one mirror is the message ‘ADIEU ET MERCI, SUSAN.’ Although the model’s elaborately coiffed head is turned away from the camera, she looks back out at us from the inscribed mirror. The photo’s grand hotel setting and atmosphere of bad-girl mischief are pure Helmut Newton. (On the photographer and his work see Lindsay Baker, “Helmut Newton: A Perverse Romantic.”) Some might relegate its subject, the Vogue 1016 dress, to a period of post-Eighties decadence, but the interplay between photographer and designer is interesting. The two had a long-standing professional relationship, and Anna Wintour, quoted in Helmut Newton’s WWD obituary, hints that Newton’s photos of Yves Saint Laurent’s work could be as influential as the work itself. Does Newton’s photograph colour our view of Vogue 1016? It’s a gorgeous dress anyway you look at it! I’m more the type who wants the details shown in the pattern envelope, rather than Helmet’s POV, but he’s fun too.